When Sheila announced at the DDXG meeting that she was organizing a club trip to Newington I asked if we (non-members) could be included. In the end it was just the four of us going up in their new Ford Edge. The trip up took nearly 12 hours driving through rain much of the way and huge traffic tie ups near the end of the trip, but we made it without incident. After a nice seafood dinner at the nearby Red Lobster our spirits were restored and we were ready for a good night’s rest. 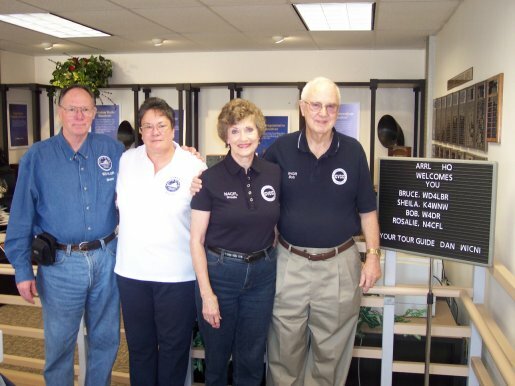 The next morning (Friday) we arrived at 225 Main Street shortly after 9 am and were greeted by a sign in the lobby welcoming the four of us, by name and call sign, to the ARRL. Just around the corner we came to Sharon T’s office. Bruce and Sheila had become fast friends with Sharon via telephone and a previous visit. I had several objectives in visiting the DXCC office and Sharon and Bill Moore, NC1L, went right to work on these requests. I wanted a duplicate DXCC certificate for my first award given to W4QCW in 1954 as my original certificate was not in good shape. Bill went to the paper archives and found the paper record of this award and a new award was immediately printed with original date and number inscribed. When I got a CW DXCC in 1990 I never requested a certificate. Bill again consulted the archives and found a date and number of that award and Sharon quickly had it printed. As a bonus she noticed that I had two LOTW Digital credits which had not been applied and she took care of that without me requesting it. In the meantime it was discovered that Sheila had 100 credits for a DXCC on 30 meters so that was also issued. She thought she had only 99 credits so this was a surprise. The difference was that she also had one deleted credit which gave her the 100. 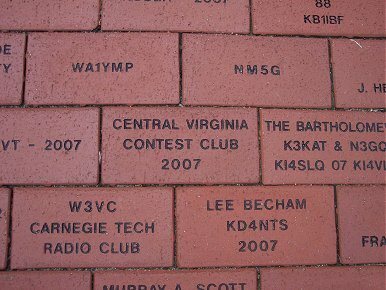 By this time we were feeling pretty good about our national radio society. Bill took us across the parking lot to the W1AW station and I sat down in front of the FT9000 on 20 meters expecting an immediate pileup on my first CQ. It was not to be as 20 was a very flat band. Sheila, Rosalie and I did manage to scratch out a few domestic qso’s including Duke, W1ZA. In the meantime another guest operator was on 12 meters using a new FT5000 and he was running Europeans as fast as he could log them. He offered me his chair and I continued the run. It was just like being on a DXpedition. I could only get partial calls each time, but what fun. After about 50 qso’s it was time for us to take Bill and Sharon to lunch at a local pub which they recommended.